The erection of the splendid Schwenkfelder Library building at Pennsburg in 1951 gave the Exile Society a focal point for its aims and interests. Housing a magnificent collection of rare books and papers relating to the Schwenkfelder movement, the Library contains the historical records left by our ancestors. For years, a very important museum and collection was housed on the second floor of Carnegie Hall, Perkiomen School, Pennsburg, PA. A major fire at Kriebel Hall directly across the street created a sense of urgency on the Board and those involved with the Library to better preserve this collection. A Capital Campaign was launched in 1998 to raise $3.4 million for the purpose of expanding the present library to bring that collection over to the Library and to expand the space available in the Library itself. Members of the Exile Society were extremely supportive contributing over $100,000. 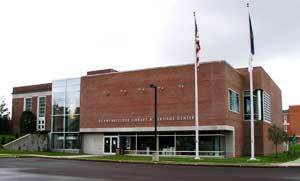 On June 24, 2001, the new Schwenkfelder Library & Heritage Center had its Grand Opening. The official Dedication of this wonderful new facility coincided with Gedächtnis-tag (Day of Remembrance), September 23, 2001.